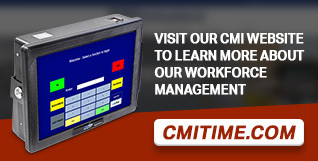 Control Module Inc. » CMI Time Management Solutions - Control Module Inc.
A subsidiary of Control Module Inc., CMI Time Management helps customers around the world turn workforce management into workforce optimization. Known for their reliability, usability, and ease of integration, our data collection products are a quantum leap forward from traditional time clocks and timesheets. That’s why more than 160 Fortune 500 companies have chosen us as their workforce data collection provider. are individually configured and customized. provide remote access via an Internet connection. Advanced Windows touch screen data collection terminals with an array of operating systems and multiple modular peripheral options, including biometrics for employee self-service capabilities. Durable time and data collection terminals with personalized display, media, reader, keyboard, peripheral options, and communication for the ultimate flexibility. Advanced human resource software for Genus® terminals automatically collects timekeeping data, tracks activity, generates reports, and distributes communications easily and efficiently. Time and attendance software links staff activity, performance, and departmental costs to your accounting software for integrated productivity reporting.